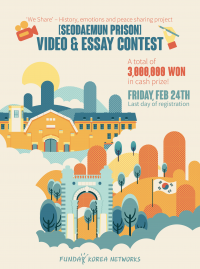 In order to introduce the unbiased history of Korea to the world, “Funday Korea Networks” is organizing a Video & Essay contest on the subject of “Seodaemun Prison”. 영상&에세이 공모전을 '서대문형무소'를 주제로 실시합니다. The total prizes value is 3 Million Korean Won in cash! Don’t miss the opportunity! Participate Now! 총 3백만원의 상금이 주어지니 지금 바로 신청하세요! - Winning teams' videos of our last video contest. * Prize could be granted in gift voucher. * 상금은 상품권으로 수여될 수 있습니다.